The story unfolds. We do our work, focus on gratitude and love, but still the Universe sends us the unexpected, some of it delightfully good, some of it heartbreakingly bad. All of it mingles into this thing we call life. I decided today would be the day that I would deal with Missy’s left over food. I have a friend who will take the bag of gourmet food, but also have an almost full bag of “back-up” kibble that I bought when we unexpectedly ran out of her regular food. 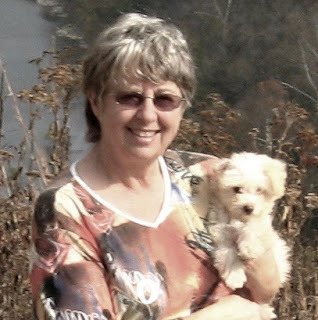 A friend told me about a woman who rescues dogs who would like the food, so I set off to find her with only minimal clues as to where she lived. Obviously, the clues weren’t sufficient because I wound up with a different woman, but our conversation revealed that she was getting ready to deliver food to some starving dogs and would be happy to take my offering. The story she told me began to ring a bell. A Canadian man rescues dogs but he had to make a trip back to Canada and left someone else in charge of feeding the dogs, six or seven of them. Apparently that person disappeared and the dogs are starving, eating newspaper and barking all the time. Missy, 3 months, on her way to her new home. When I asked for a few more details, we discovered that it was one of those dogs that rushed Missy and caused her to get hit. The cycle of all of this makes me shake my head and weep. I’ve tried not to blame the other dog, but I have to admit to having hard feelings toward it. Now, I find that the poor dog was apparently trying to escape its abuse and starvation. Missy’s food will help feed that same dog. It’s too complicated for me to comprehend, but it feels like karma in action. Challenge #18 directed us to create three images of specific sizes that would hang together, each individually whole yet related to the others and all tied together with one word. I started trying to find a theme and pulled up a lot of keyword photos but nothing was sparking. I decided to let the images come to me, so I randomly browsed through my favorites file and pulled three that jumped out at me and then looked for some common element that tied them together. 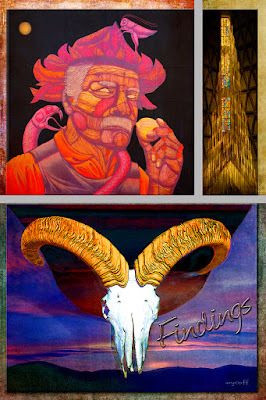 The above image … Findings … were all things that took my breath away when I found them ... a mural in San Miguel de Allende by Sego, the inside of a cathedral (San Francisco, I think), and a big horn skull hanging on a fence in New Mexico superimposed on a high desert sunrise in the eastern Sierra where I lived for two years. I started to use the theme word "golden" because each image has a golden tone, but love the idea of finding unexpected beauty. I also love the feeling of letting things come to me, letting stories unfold, being open to the unexpected regardless of whether or not I would choose to have those things come to me. There are streams of thought that hold that we can affect what comes our way ... we can attract good things, magnetize or manifest connections and abundance. I like those thoughts and believe that when we think like that, we change ourselves and that affects our own actions and our surroundings. I don't know if it goes beyond that, but I do know that we are in charge of how we react to what comes our way. We can make art out of the materials we have at hand. We can create life and love from the circumstances around us. "Findings" feels like a word that helps me remember to honor what comes my way. YES to .."we are in charge of how we react to what comes our way." Like being open to the forgiveness/resolution/acceptance you seem to be approaching re:losing Missy. Thanks, Susa. Life is such an interesting adventure. Thanks, Maggi ... it amazes me to be on this journey!